The BMC officials inspected more than 600 hotels and restaurants. Actions were taken against 357 of them, sources said. 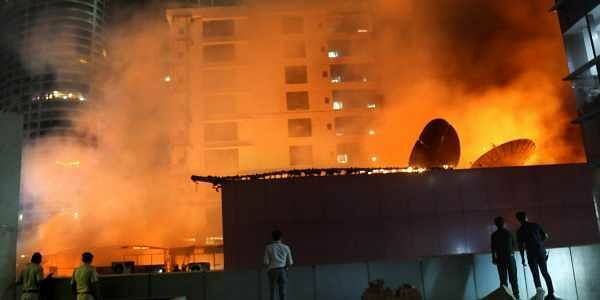 MUMBAI: The BrihanMumbai Municipal Corporation (BMC) continued its crackdown on illegal structures in Mumbai on Sunday, following the Friday's fire at Kamala Mills. The BMC officials inspected more than 600 hotels and restaurants. Actions were taken against 357 of them, sources said. Also, some portions of at least 30 hotels were sealed. Meanwhile, Byculla police on Sunday arrested Rakesh Sanghvi and Aditya Sanghvi for allegedly providing shelter to Hitesh Sanghvi and Jigar Sanghvi, the owners of the 1-Above pub. While Rakesh is the uncle of Hitesh and Jigar, Aditya is their cousin. They were immediately released on bail. “Search is on for another relative, Mahendra Sanghvi. A lookout notice has been issued to prevent him from fleeing the country,” said Avinash Shingthe, senior police inspector of the Byculla police station. Though Opposition leaders like Nitesh Rane argued that the demolition drive is a farce, citing that some of the places where the action was taken on Saturday were seen transacting businesses on Sunday, the BMC continued with its drive to demolish unauthorised structures of restaurants, hotels and other food joints. Mahesh Lunch Home in Fort area of the city, Cafe Fumo near Mahalaxmi Temple, Rooftop Wellspun at Kamla Mills Compound, Jai Bhawani restaurant at Phoenix mall, Sheesha Lounge at Raghuvanshi Mill Compound, China Bistro, Dadar west, Bombay Theka at four bungalow Andheri, Madmax at Versova, Holiday Inn Rooftop Aksa Restro Bar Madh Jetty Road, Center Point Dhaba at Borivali, K Star Mall at Chembur, Yogi Hotel at Chembur, Mejban and Corner house at Union Park are some of the hotels where unauthorised constructions were demolished and materials like Hookah accessories, unauthorised gas cylinders were seized on Sunday.